Mercedes sedans are all about stately comportment. Corvettes are all about getting your Ya-Yas out. Today’s Nice Price or Crack Pipe Mercedes 250SE might be the best of both, that is if its price seals the deal. On the Mr. Plow episode of The Simpsons, Homer got tired of playing the waiting game and instead chose to play Hungry Hungry Hippos. Those interested in yesterday’s 1987 VW Scirocco 16V were paid dividends for their waiting out its seller, as while we were cautiously mulling his price, he dropped it by a good five-hundred dollars. That’s a good thing since you all gave it a narrow 51% Crack Pipe vote at its original asking, mostly due to its extraordinary (for a Scirocco) mileage. 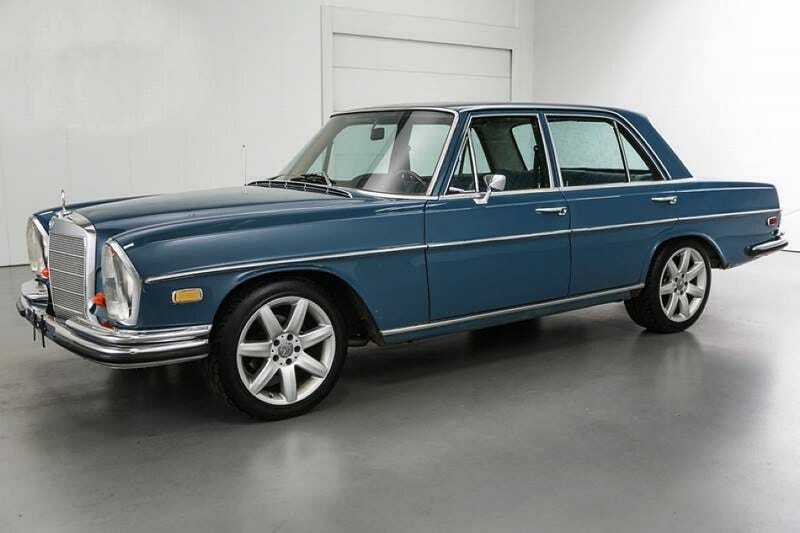 Now, if mileage is your primary determiner of automotive value, then you are certain to like today’s 1968 Mercedes Benz 250SE as its ad claims it to have only done 375 miles. I should probably put an asterisk after that because the 375 is apparently only since the car was imbued with a Chevy crate motor and a GM corporate 700R4 automatic, which its ad says occurred about five years ago. The rest of the car looks like it’s gone quite a few more rounds. Less than four-hundred miles in five years? What did they do, only drive it from one side of the block to the other on street sweeping days? Okay, whatever, let’s talk about that build. The aforementioned Chevy V8 and backing slusher are joined here by some other non-Mercedes parts, including a rack & pinion steering (I think it would have originally been worm and roller), headers, and a bitchen stereo for all your sick beats. Also serving to take you out of the Mercedes mystique is a floor-mounted B&M shifter and a set of new gauges to tell you just what that crate mill is up to. The rest of the car is half-way between old school stately and past-her-prime prostitute rat rod. The body looks to be straight, and admirably in its original metallic blue paint. There are however, signs of road rot in the places you would expect to find it: at the base of the wheel arches and the front crossmember. There’s also some pop-through on each of the rear corners, while the nose exhibits years worth of road pepper as well. At least the suspension mounts seem to be solid, and in fact, all the rust looks to be manageable and not out of control. Modern but thankfully Mercedes wheels hold the car up, while traditional euro lights effectively class up the nose. The interior continues the shabby chic mantra with MB Tex that has worn through on the driver’s throne and suffered a puncture on the passenger’s side too. That’s quite remarkable—which is why I’m remarking on it—as next to diamond, MB Tex is generally considered the strongest and most durable material known to man. I’ve seen Benz’s in the junk yard that looked like they’ve passed through the digestive tract of a whale, but with seats that still appeared factory fresh. The rest of the interior comes across as not great but not bad, and while there is an A/C compressor bolted and belted to the engine, I don’t see evidence of any other component of the system, or even of a heater for that matter. The seller says that the car handles like a track car. Now could mean a racer or that truck with the jet engine some tracks use to dry the surface after a rain, I honestly don’t know which. The ad also claims the car to be turn key which leads me to wonder just how sellers in the future will describe ready-to-go cars that have push-button start? This one handily takes a key, and here’s a video of it doing its thing. This is a pretty cool car and probably about half-way to being awesome. It is seemingly drivable as it sits, but could stand to have the rust addressed and some additional sorting being done. The asking price is a cool $9,900 and we now all need to get on the vote train and choo! choo! choose if that’s a decent price or not. What do you think, could this Mercedes/Corvette mashup really command $9,900? Or, is this a bruiser cruiser with a price that knocks it out of contention? Autotrader out of Grand Rapids MI, or go here if the ad disappears. H/T to Sterling91 for the hookup!